Unlike in my home country Germany, you have to extend your Driver’s License in Thailand every few years. The extra papers you need for this procedure are a health certificate from a local doctor for 100 Baht and a residence certificate from the immigration office. Because you usually have two driver’s licenses in Thailand, one for a car and one for motorcycle, it is ok if you bring 1 original and 1 copy of this documents. Furthermore you need your passport with a valid Tourist Visa or a Non Immigrant Visa. A passport photo is not needed, this will be done at the LTO. At the LTO, you’ll have to hand over the above mentioned documents and sign the application for the new driver’s license. Bad luck if you show up too early at the LTO and they want you to watch the infamous traffic video for 1 – 2 hours. I was lucky and got arround this procedure and just had to perform an reaction and colour test. 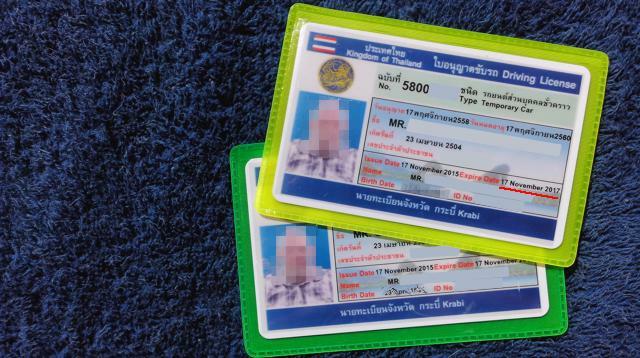 After you pass this tests, you need to pay about 750 Baht for the two licenses and fall in line for the photo and the new driver license card. As far as the extension is concerned, you’ll get two years with a Tourist Visa or five years with a Non-Immigrant Visa. This article describes the driver’s license extension in the LTO in Krabi. There may be small differences in the procedures to other LTOs in other provinces in Thailand.